One has the impression when watching him run that Master ‘N Commander is still a big baby and is taking a while to mature. He will soon be turning four-years-old but this Geoff Woodruff-trained has only raced six times. He has notched up just one victory and has only been unplaced on one occasion but in his last two starts the son of Captain Al suffered narrow defeats. Two runs back, with Piere Strydom in the irons, Master ‘N Commander was touched off by Urgent Fury over 1700m while in his last start, with Gavin Lerena up, he went down by a long head to Africain, this time over 2000m. Both of those runs were on the Vaal turf track. Today Master ‘N Commander lines up at Turffontein to contest a MR 85 Handicap over 2000m on the standside track. This is a jump in class for the gelding but it all came about because the handicappers bumped him up 3.5kg for finishing second to Africain. In fact, his rating has gone up 10 points (5kg) for running second in his last two starts. That does put a bit of pressure on Strydom who takes the ride once again, but he has ridden this fellow on three previous occasions, including his maiden victory, and will know what to expect. The opposition does not look particularly menacing. Sean Tarry is scheduled to saddle Red Rain but this four-year-old gelding was due to run at the Vaal yesterday and it is doubtful whether Tarry will run him on both days. 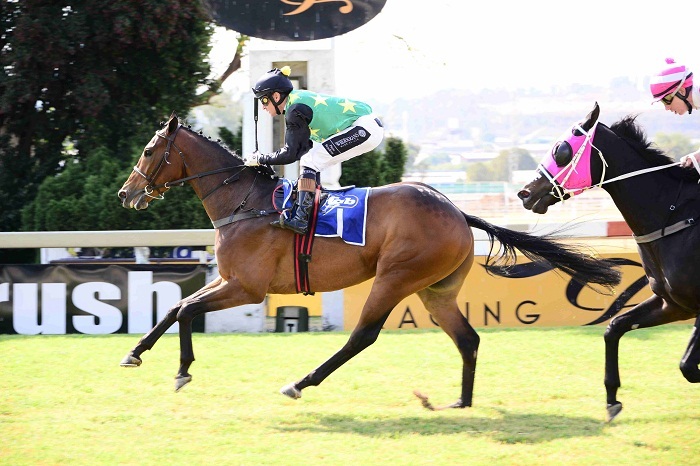 Scent ran against some of the best three-year-olds in the country when contesting the Listed Derby Trial and the Grade 1 SA Derby over 2000m and 2450m at this course respectively. He ran well enough in the Derby Trial with 52kg on his back, finishing a 5.35-length seventh behind Legal Eagle at level weights, but was then well beaten in the Derby, ending up 19.50 lengths back in 10th place behind the same horse. Ormond Ferraris’ charge has subsequently run two races in which he was beaten by Deo Juvente, also trained by Woodruff, but he seems to reserve his best runs for the inside track at Turffontein. He is well drawn at No 3 and Karl Zechner takes the ride. The best of the rest looks to be Inala, but Mike Azzie’s charge has yet to prove he will go 2000m.